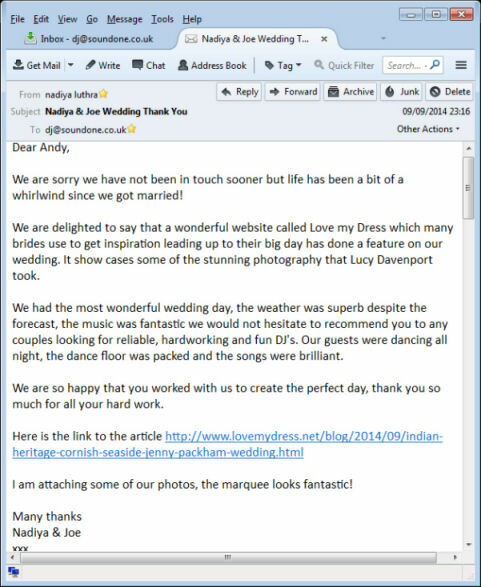 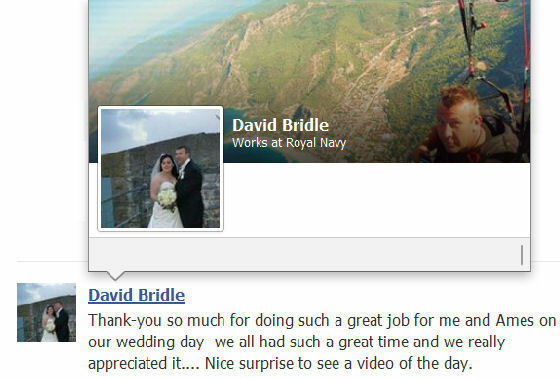 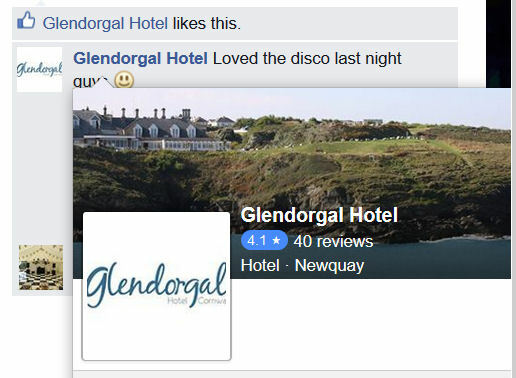 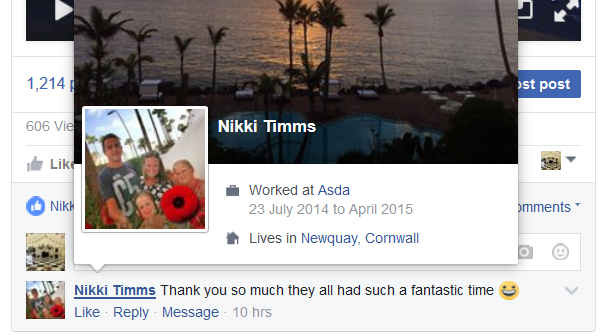 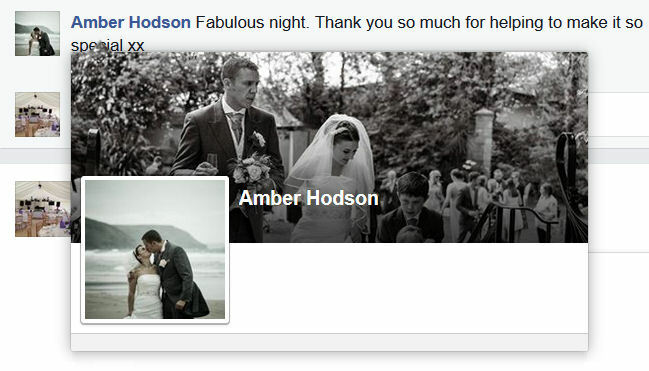 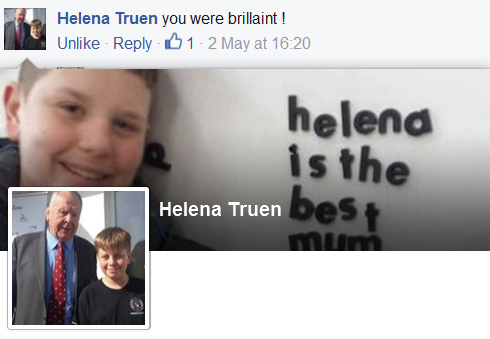 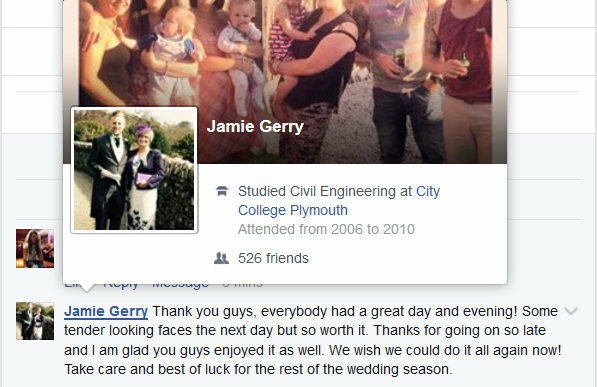 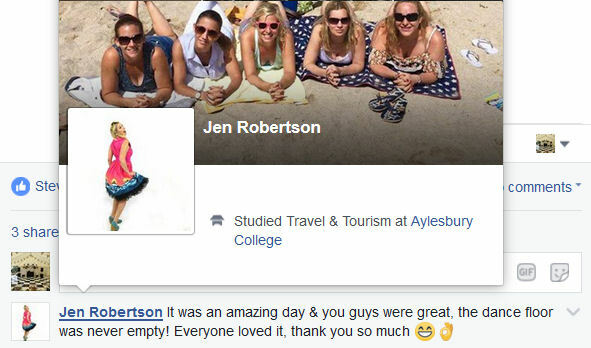 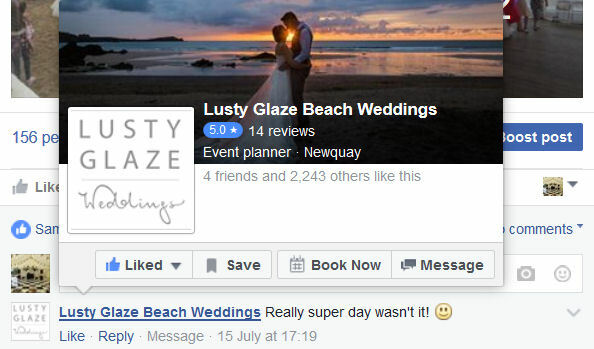 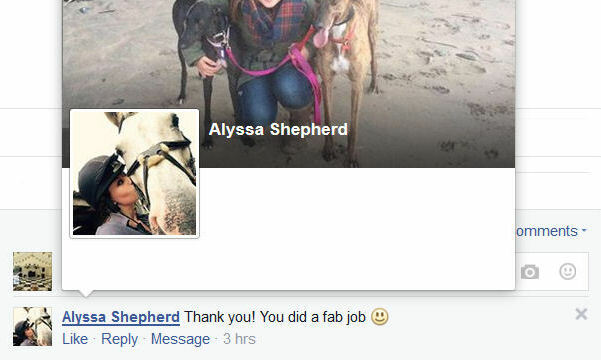 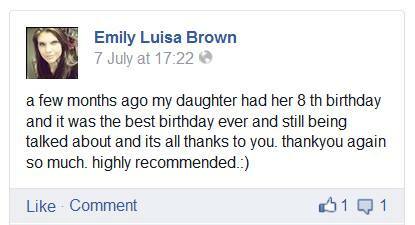 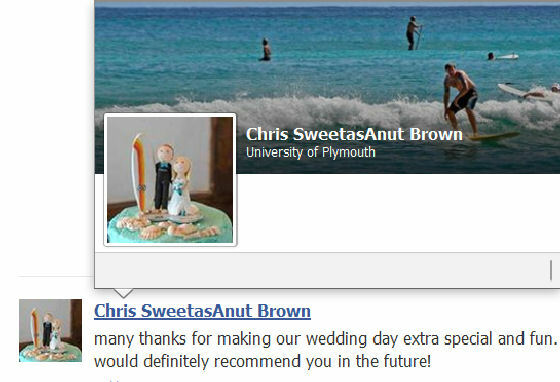 We get quite a lot of positive feedback, so on this page you will find a broad selection of some of that feedback. 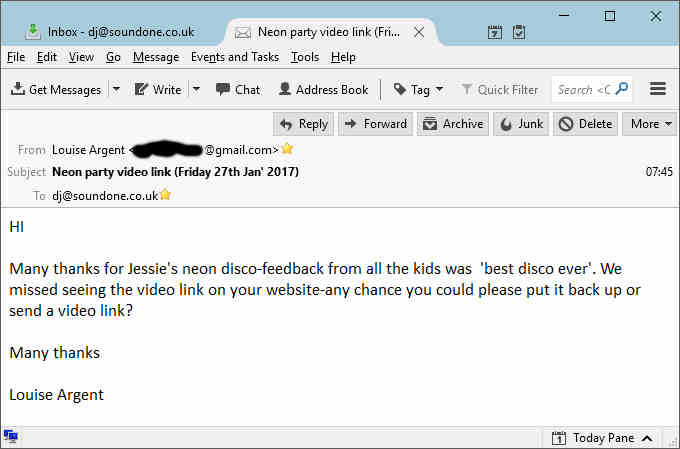 The feedback comes from a variety of different sources. 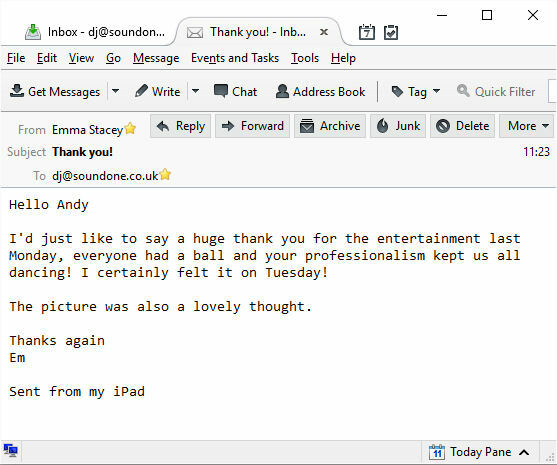 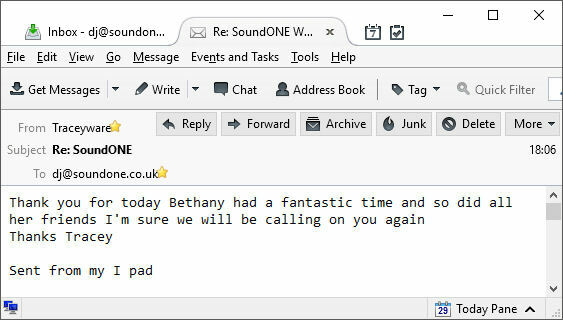 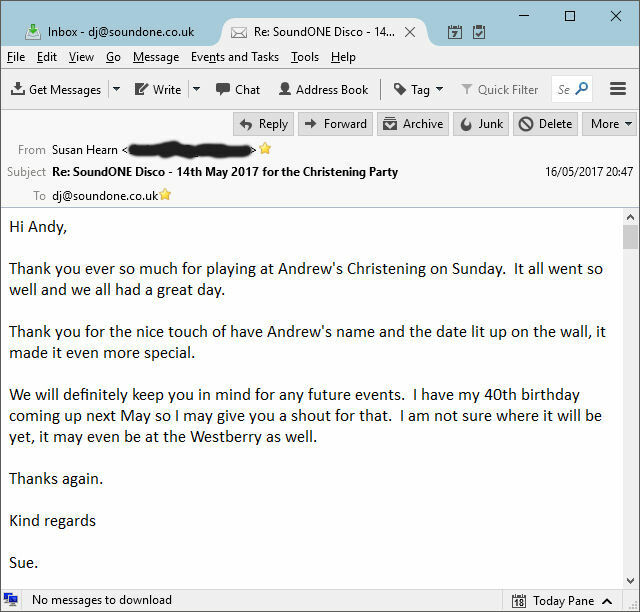 Some are from emails sent directly to us, text messages sent to our phone, postings and ratings left on our facebook page or letters and cards sent to us by post. 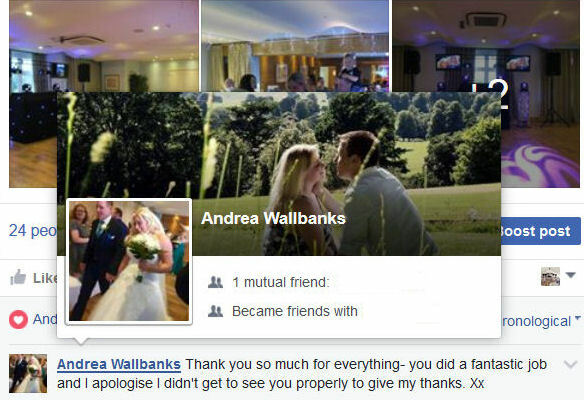 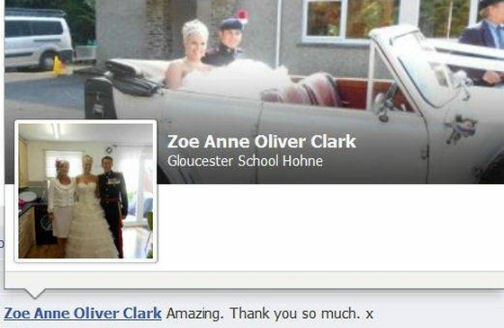 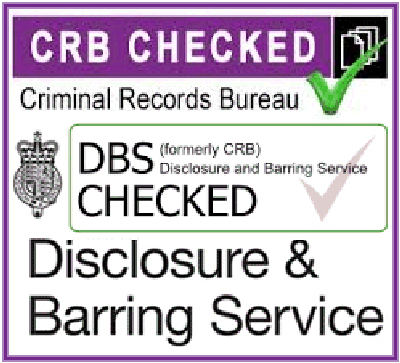 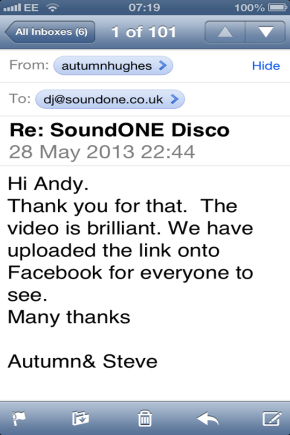 Please note: as shown all of our feeback is genuine and verifiable. 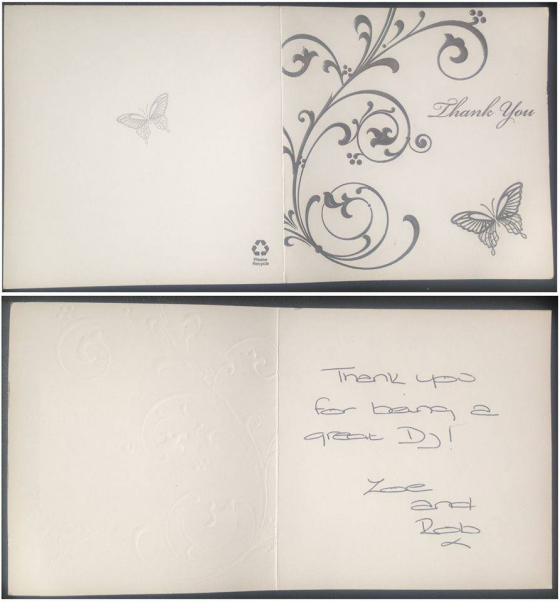 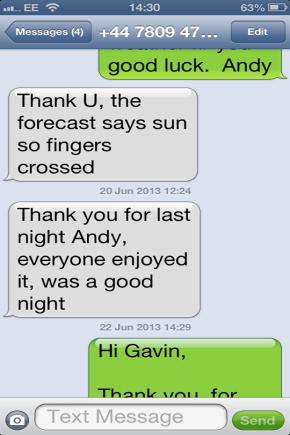 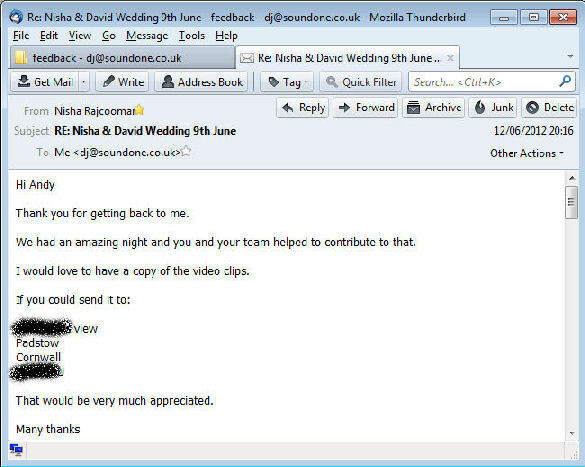 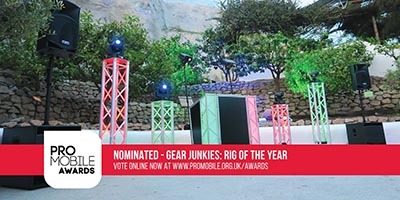 We only show you screen prints or scanned images of the actual feedback we have received. 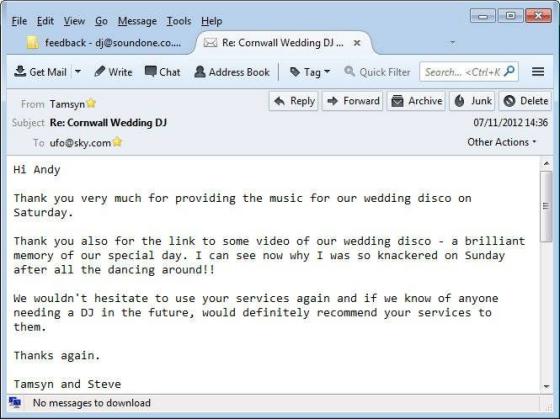 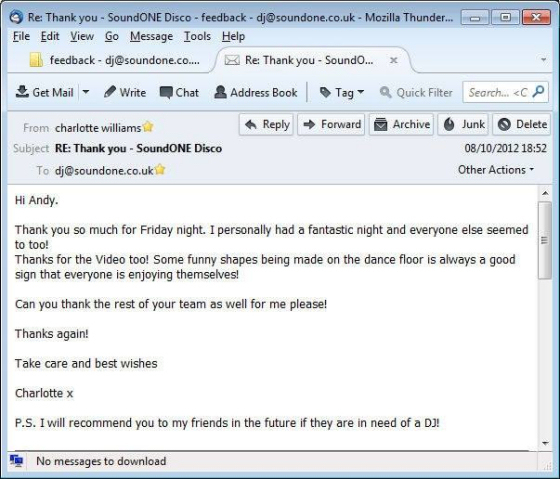 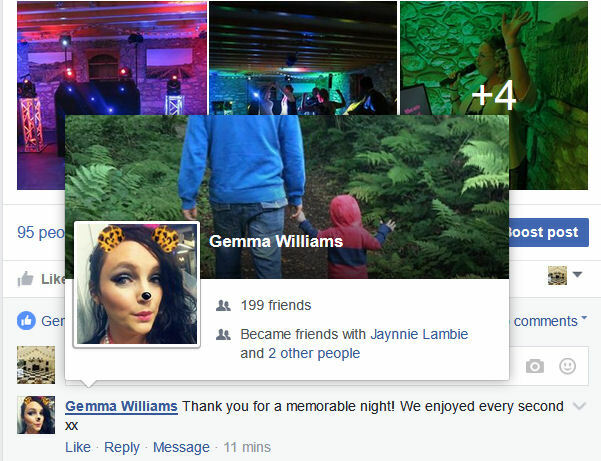 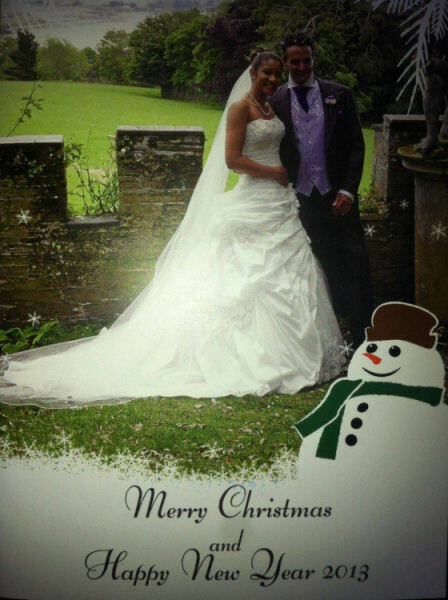 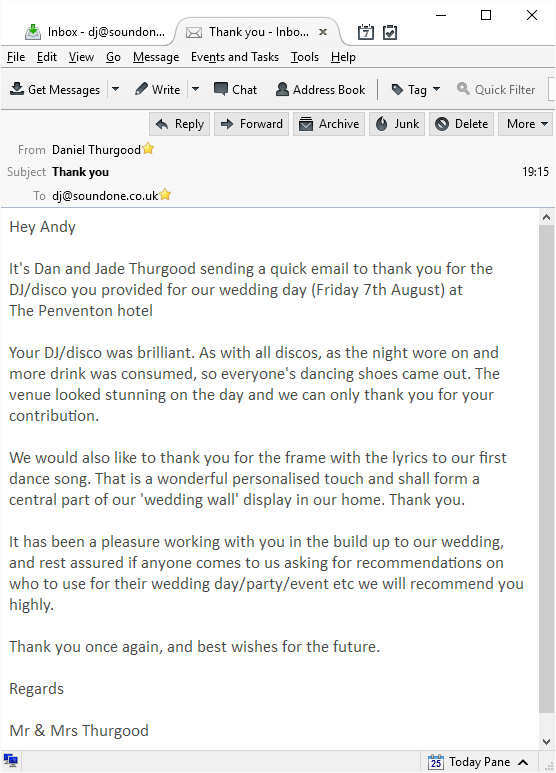 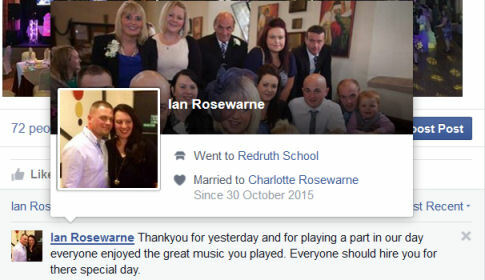 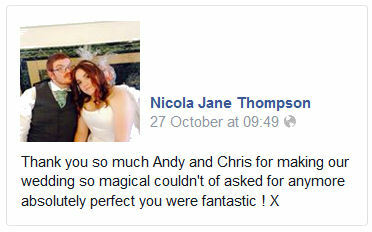 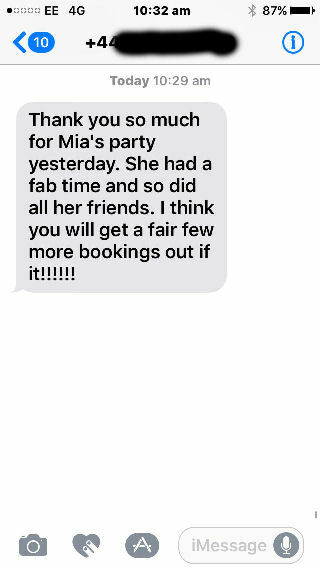 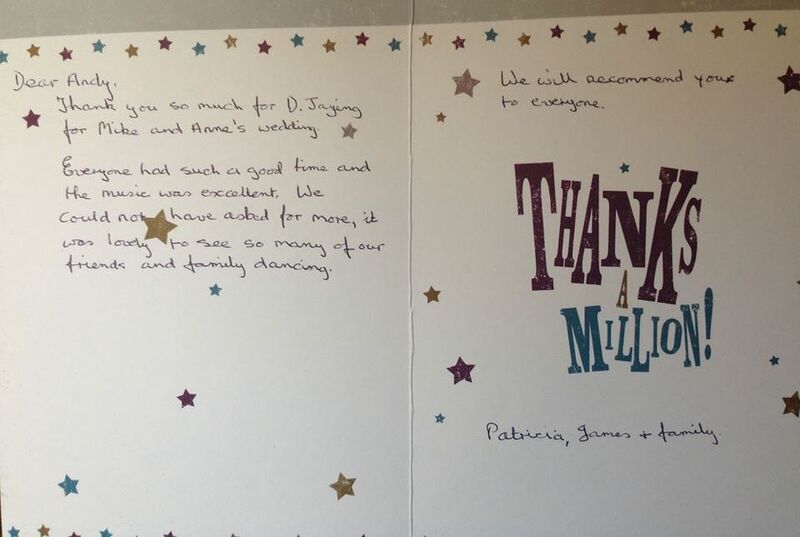 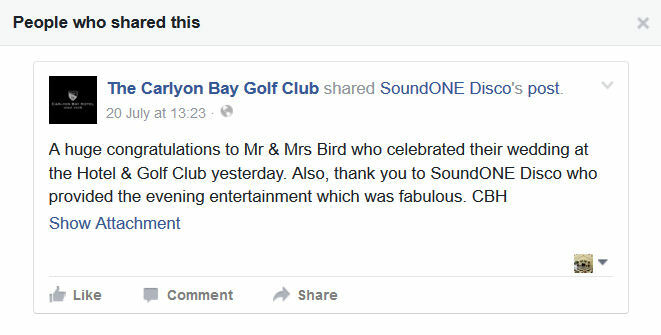 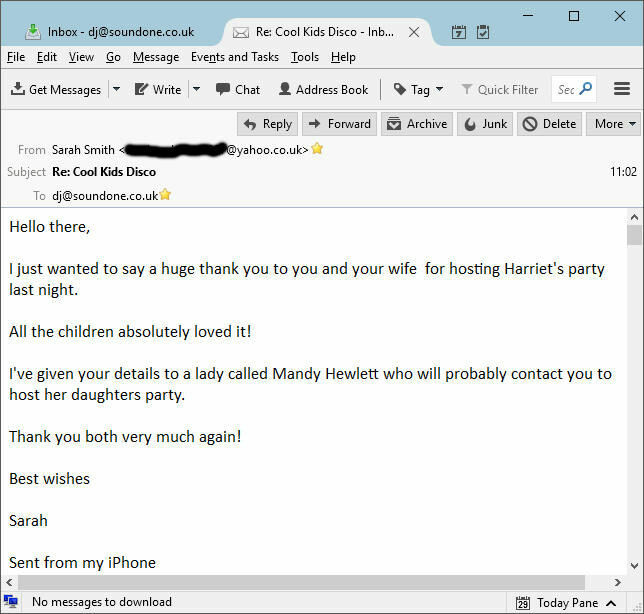 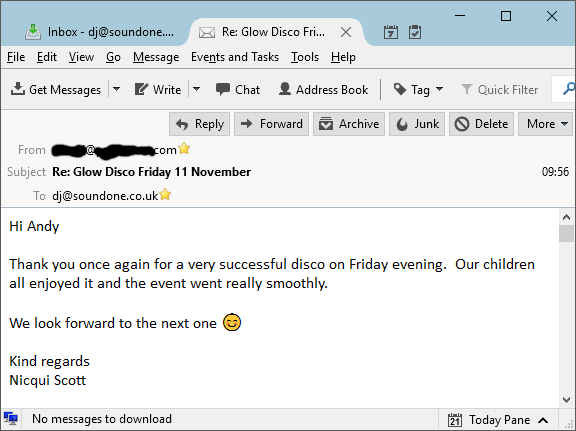 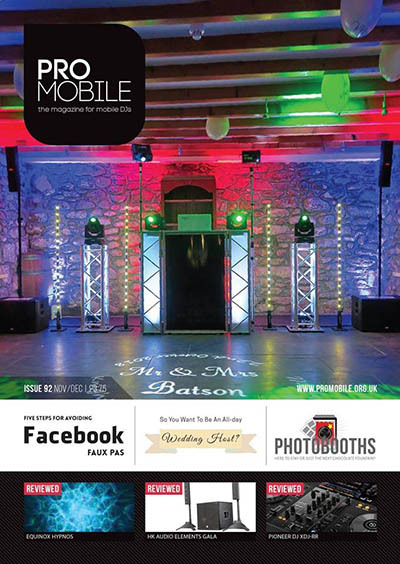 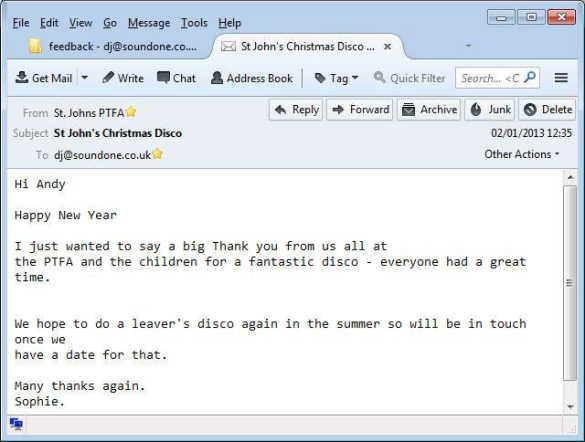 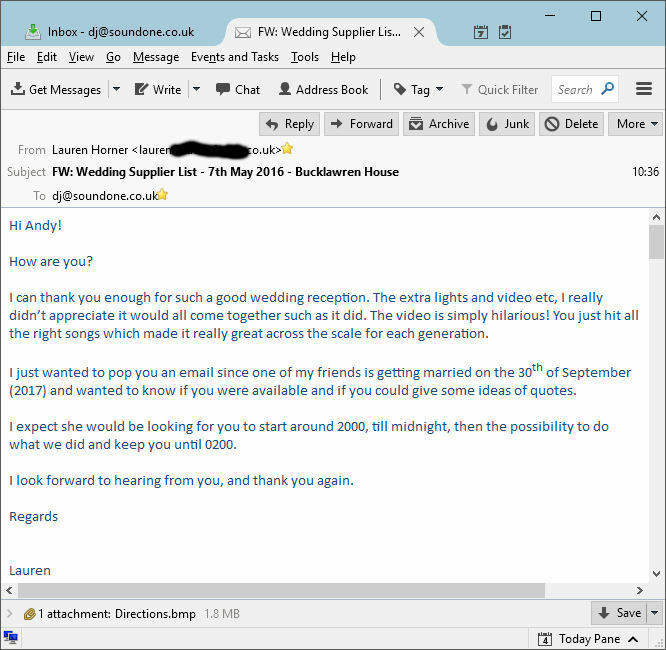 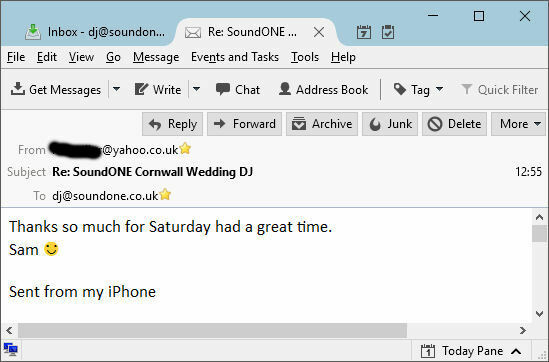 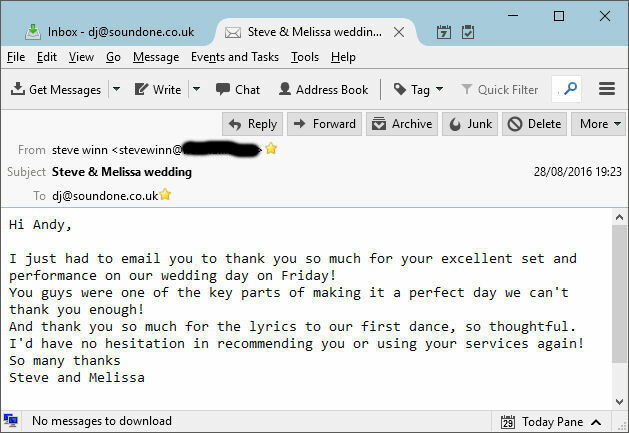 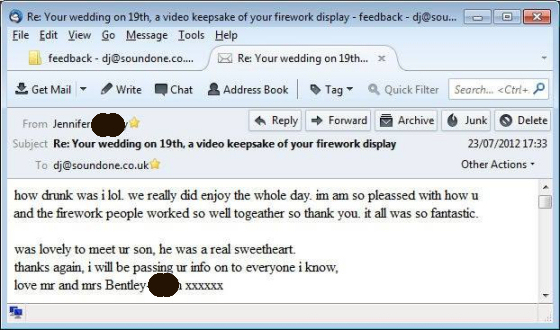 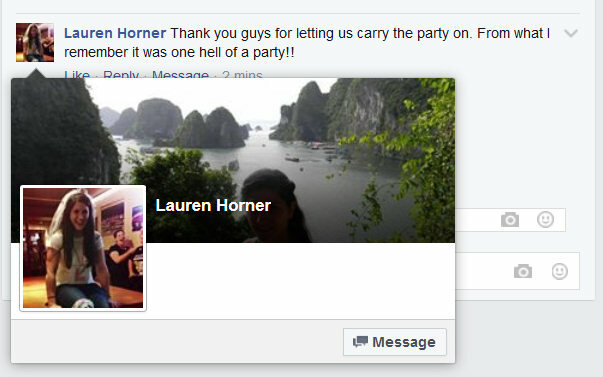 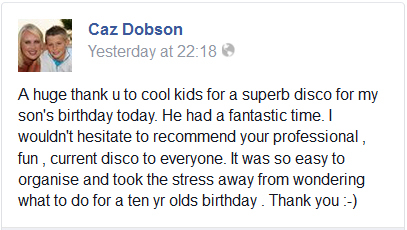 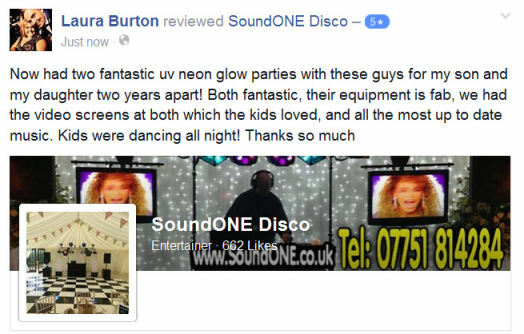 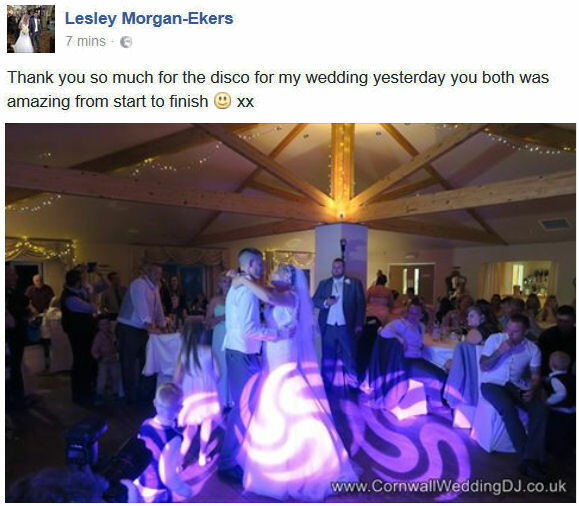 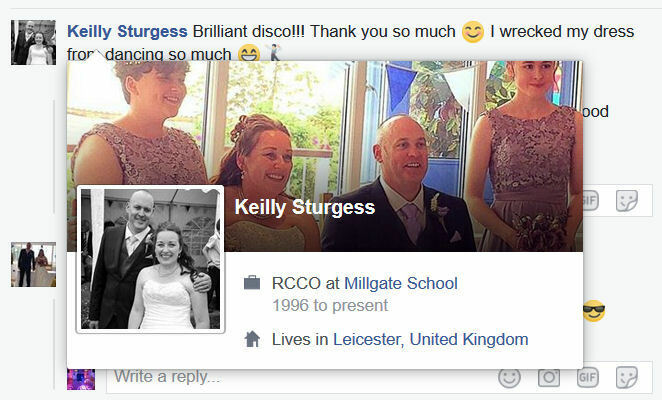 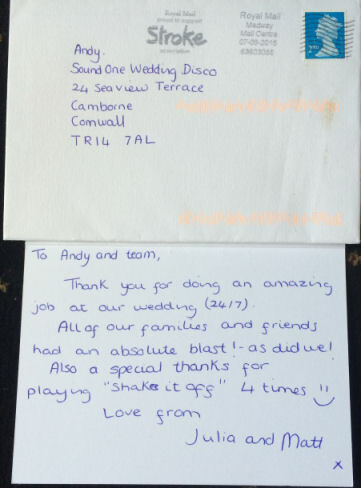 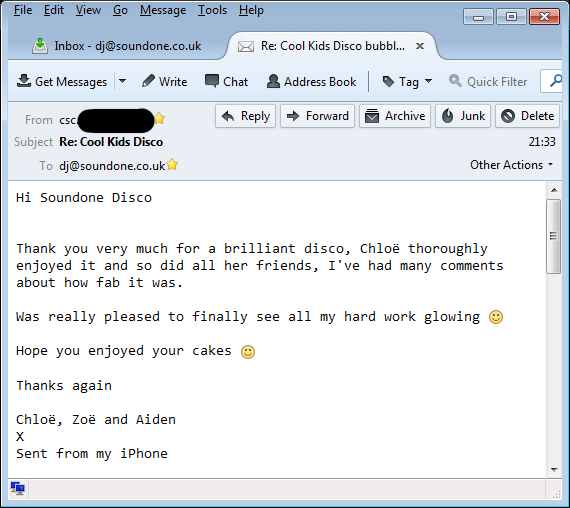 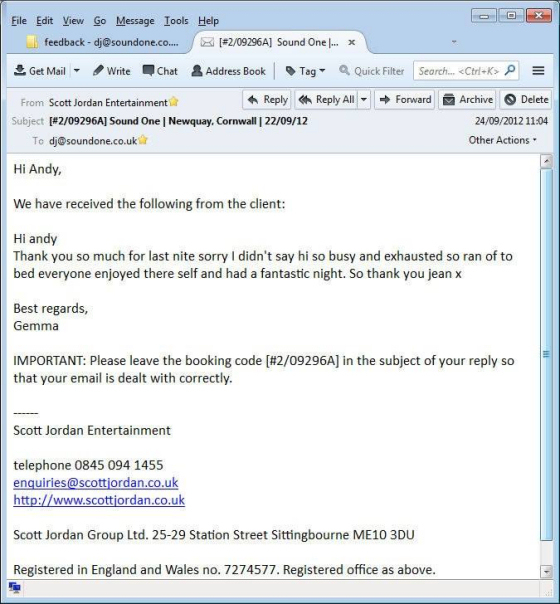 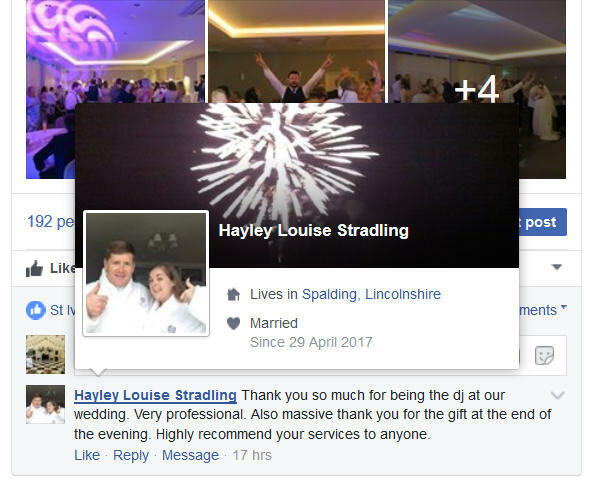 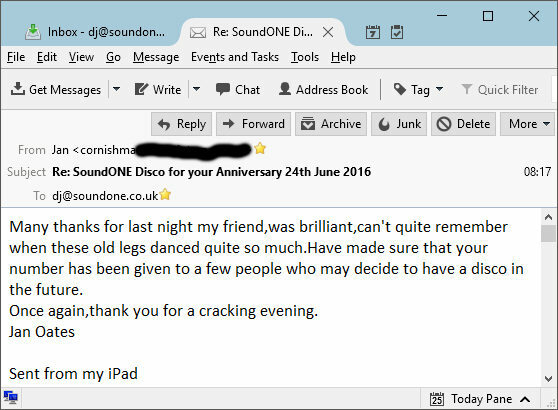 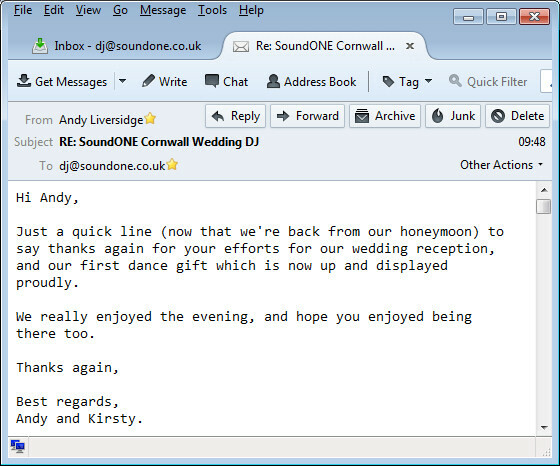 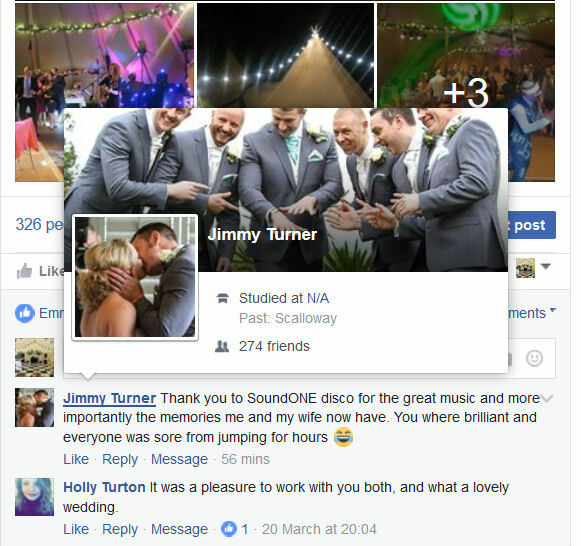 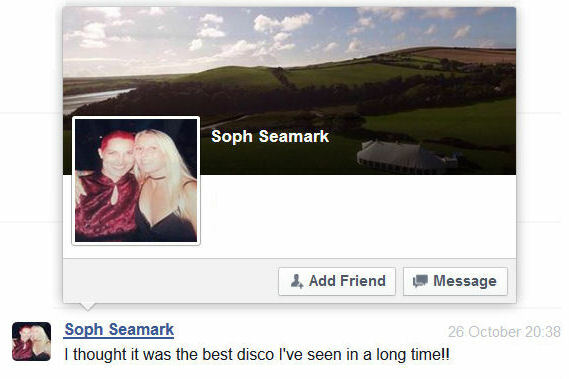 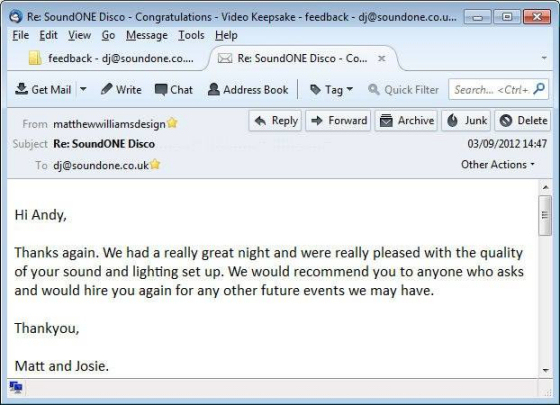 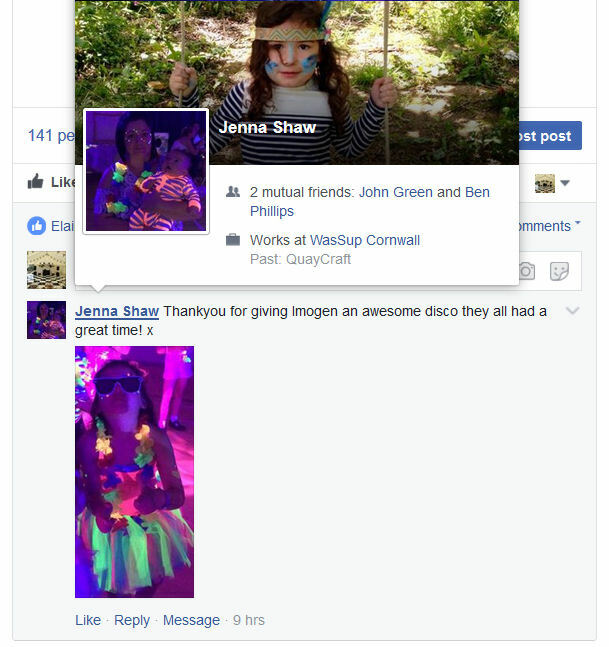 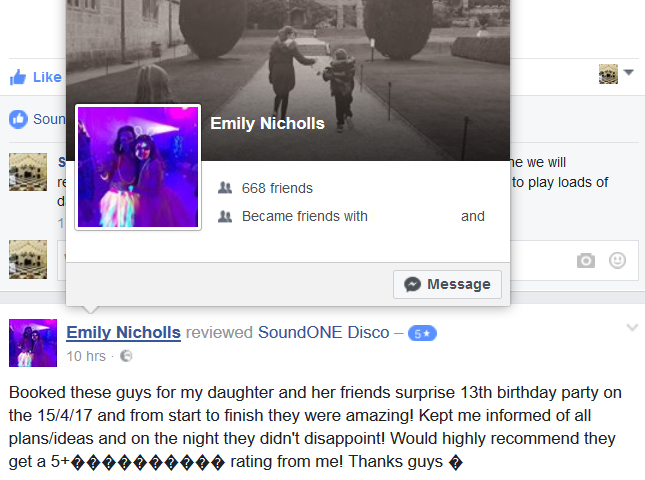 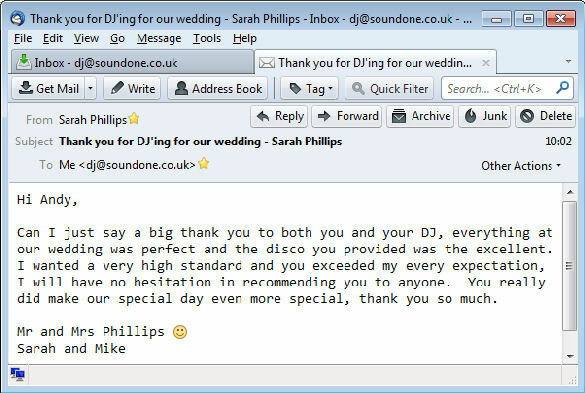 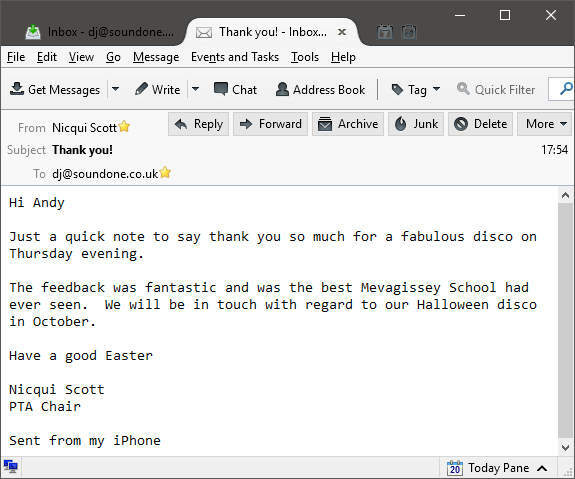 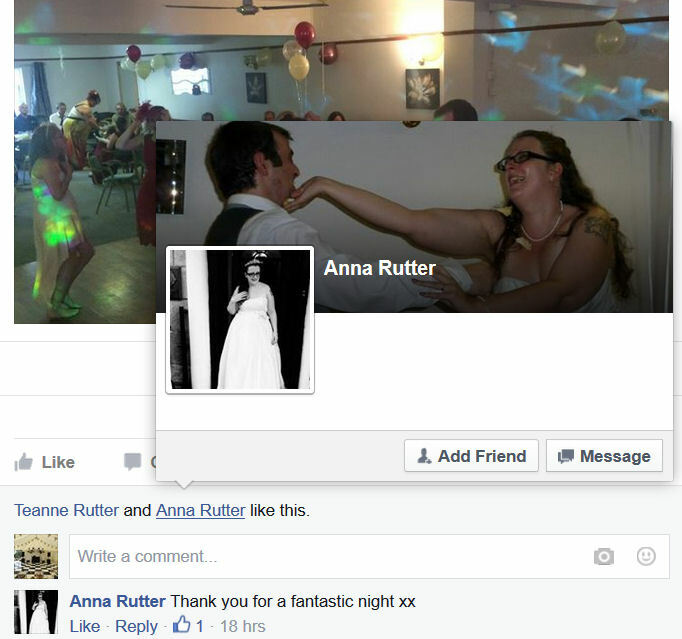 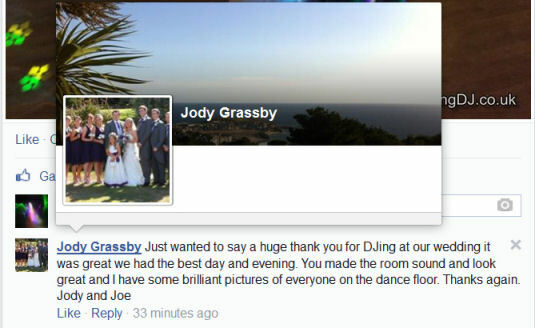 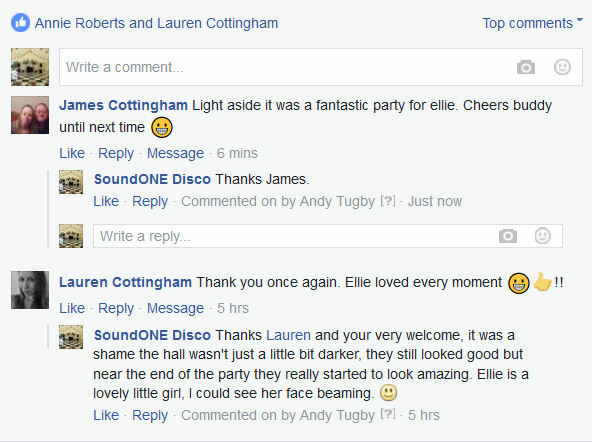 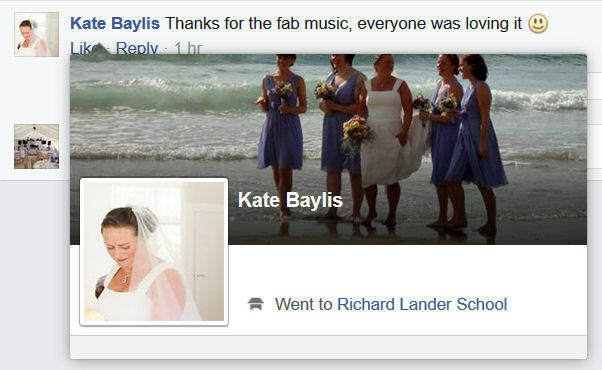 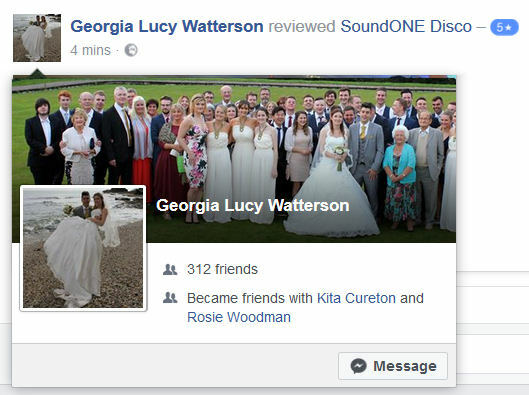 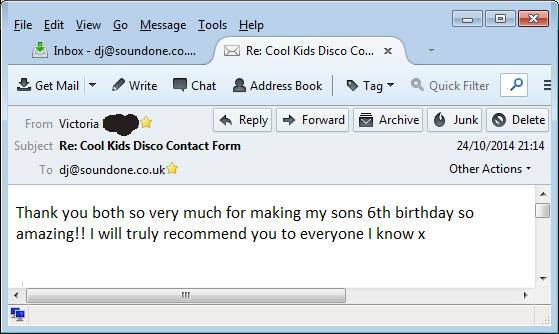 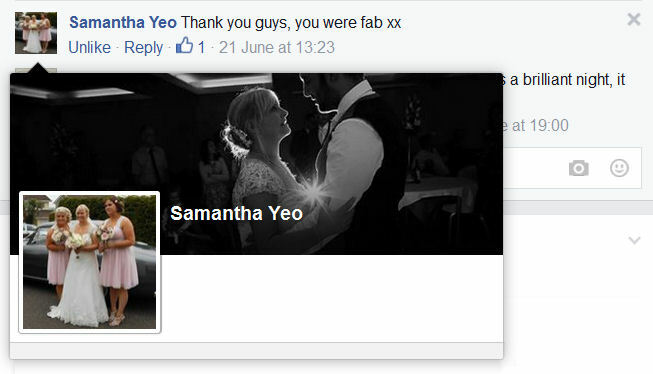 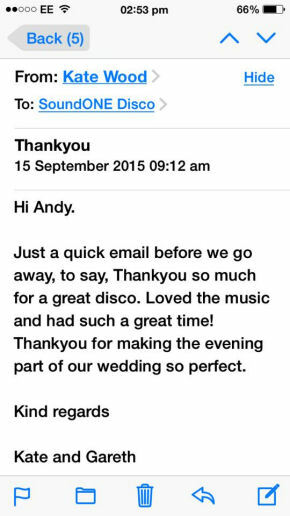 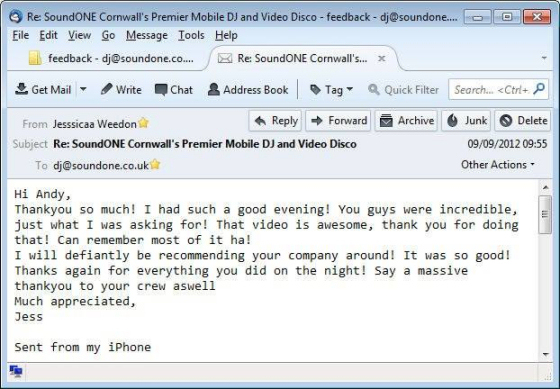 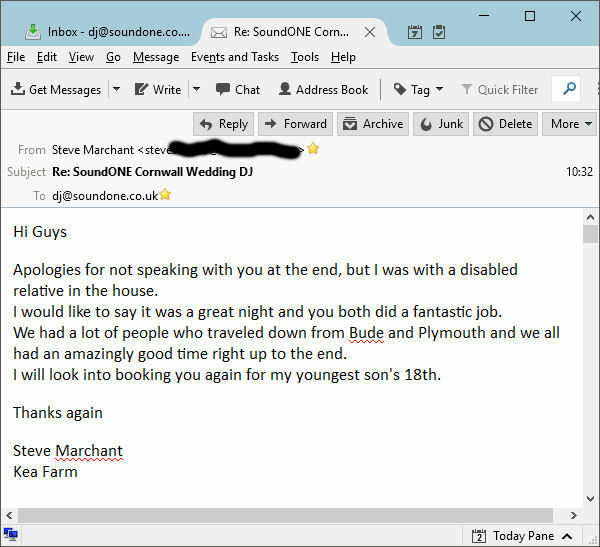 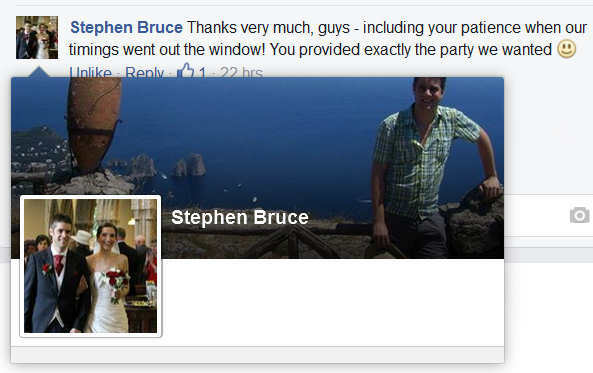 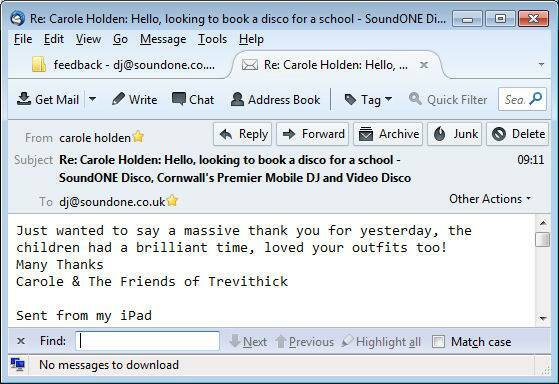 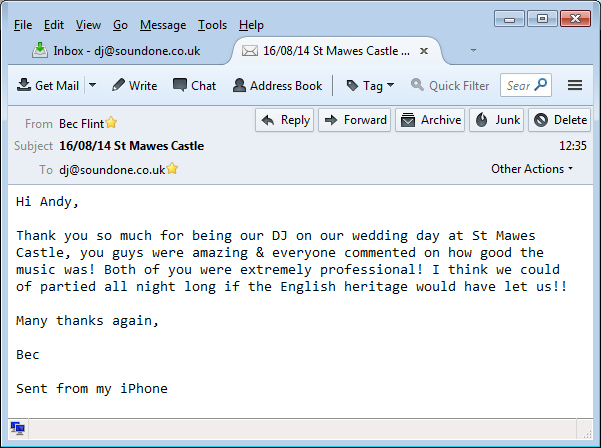 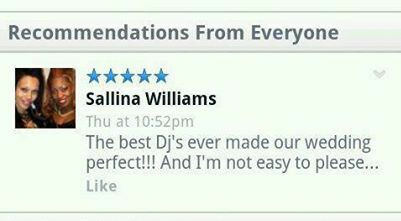 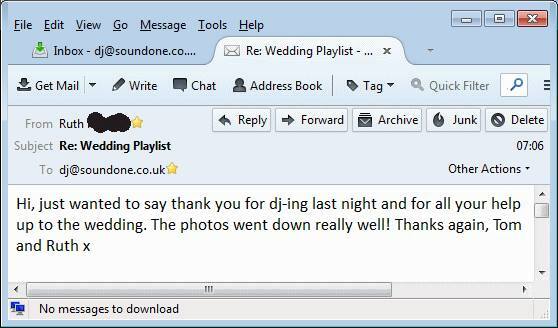 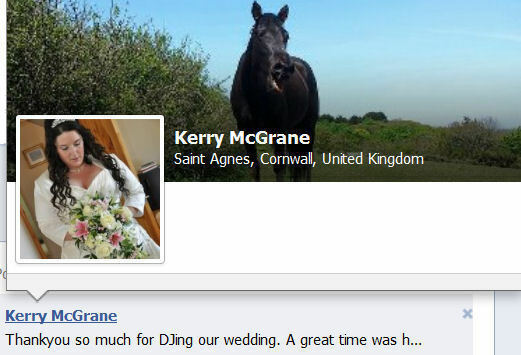 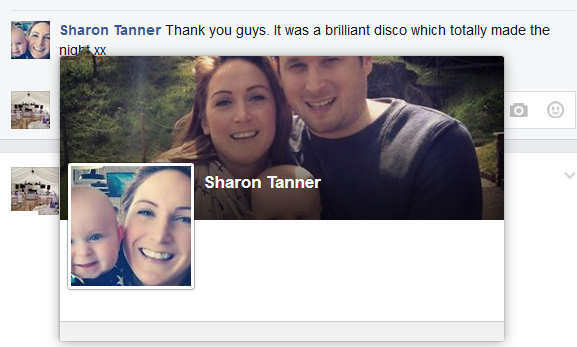 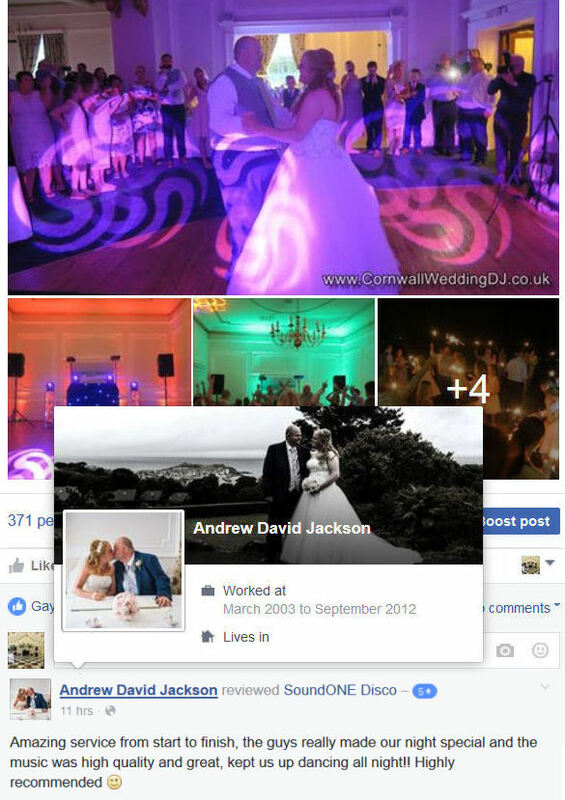 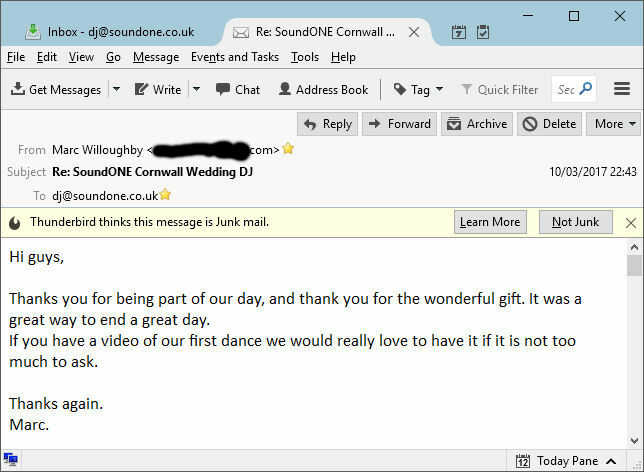 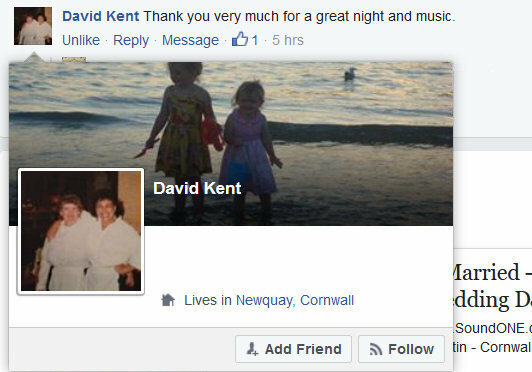 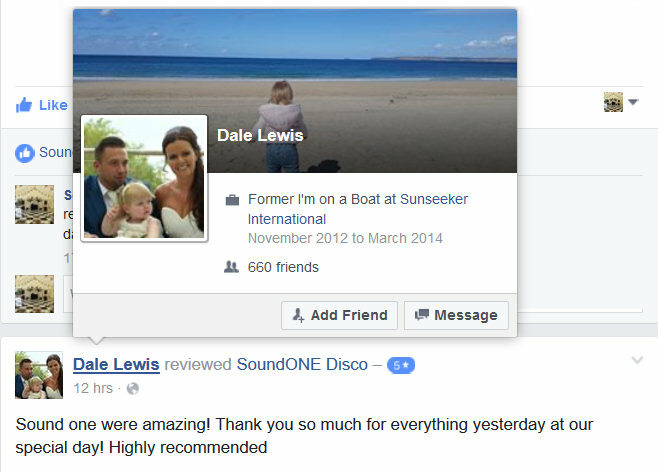 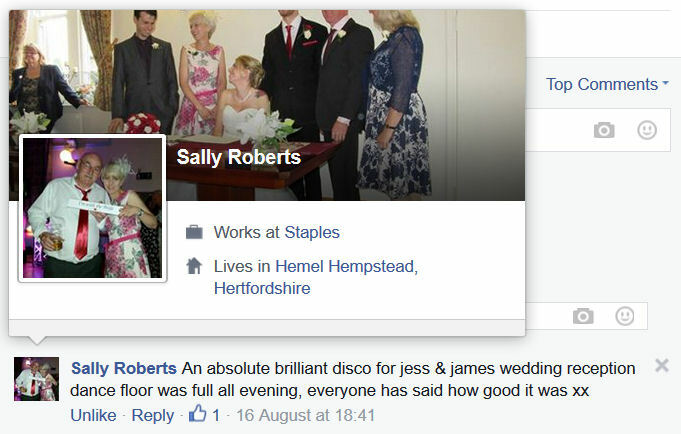 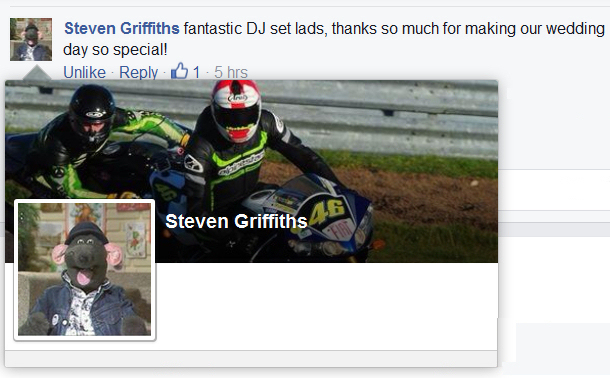 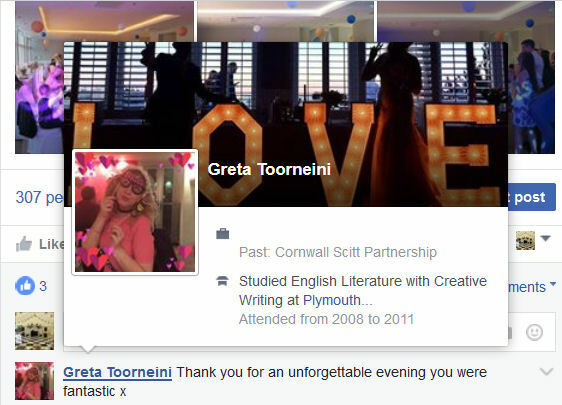 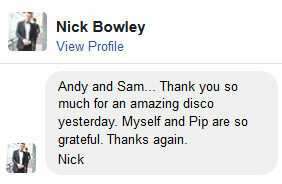 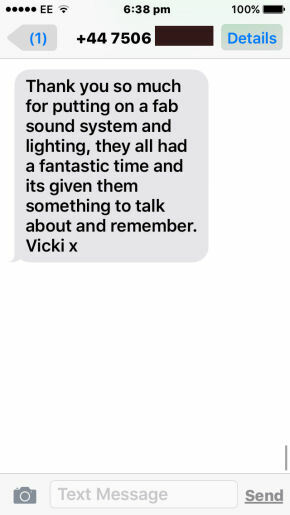 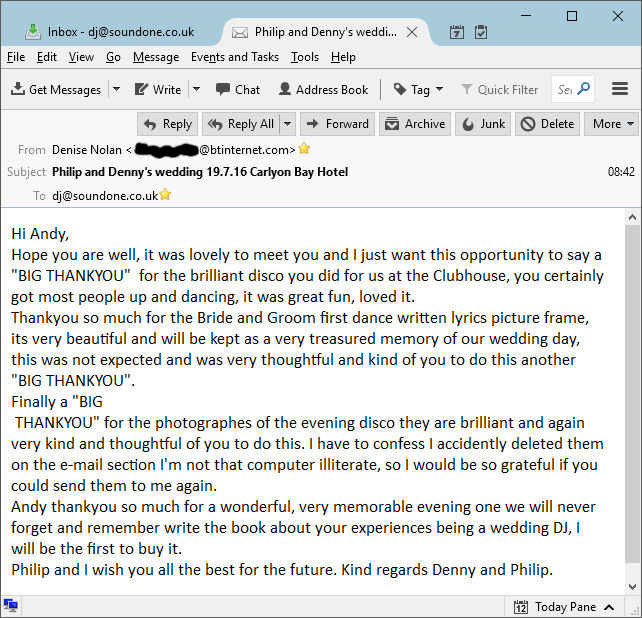 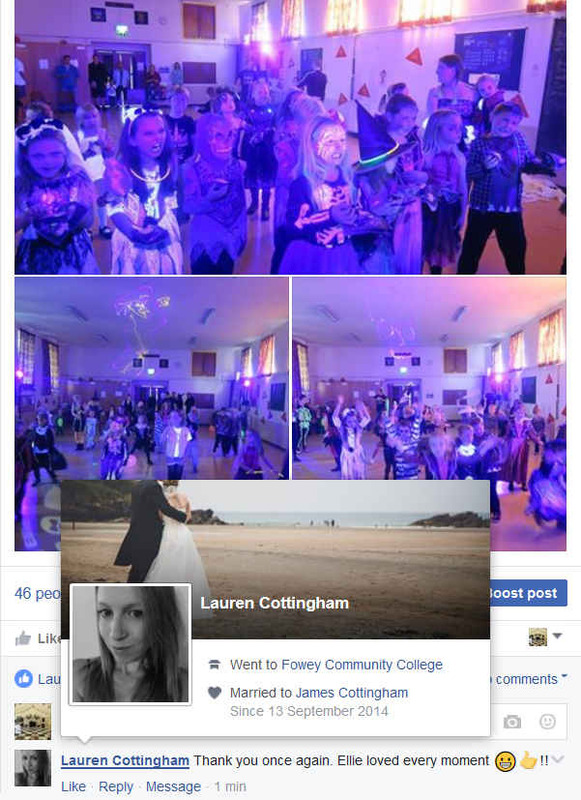 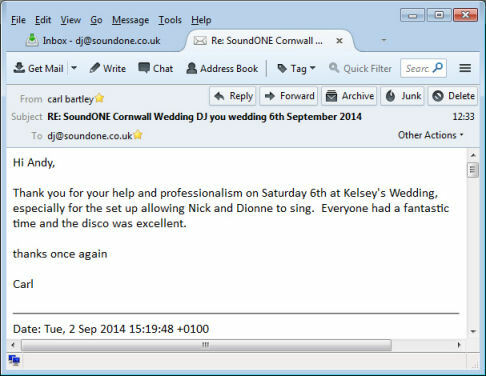 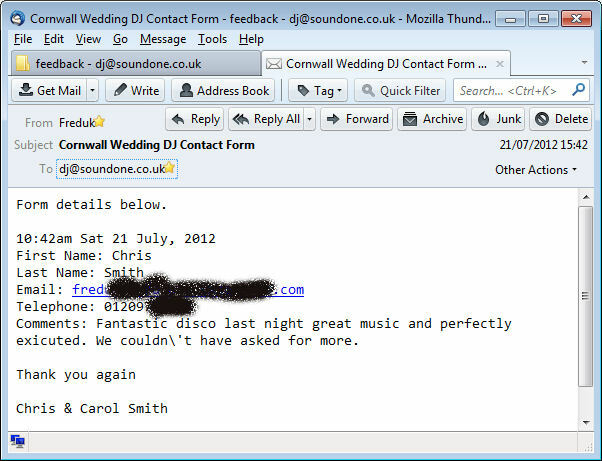 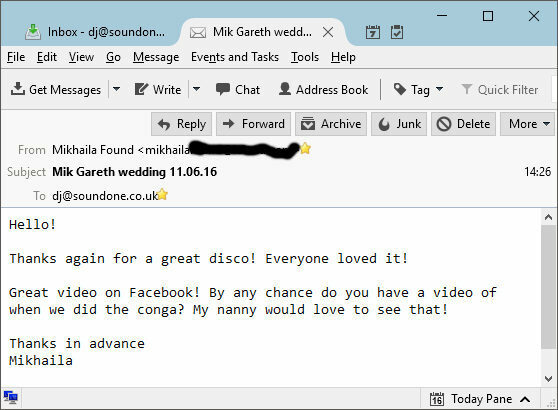 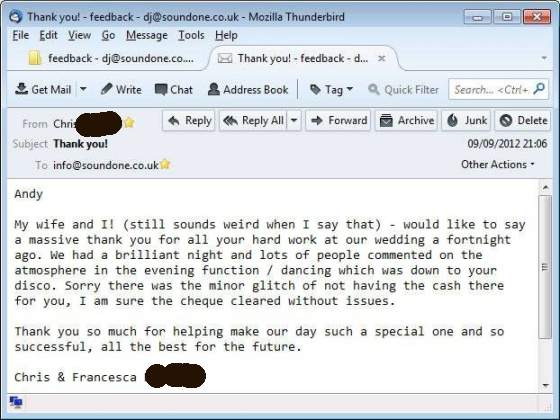 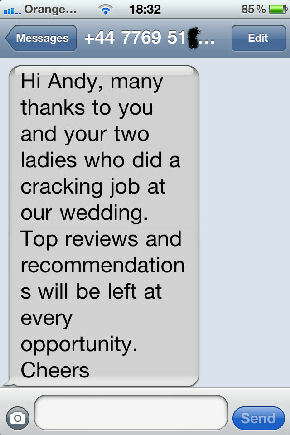 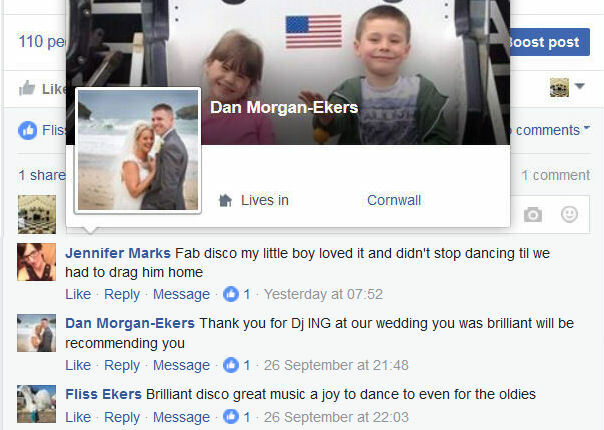 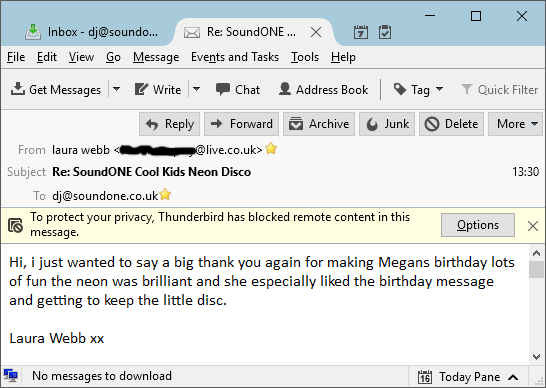 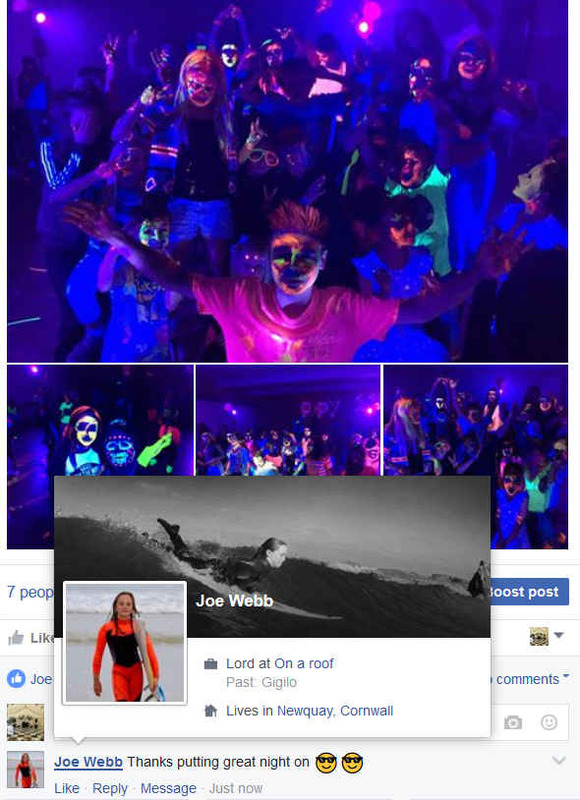 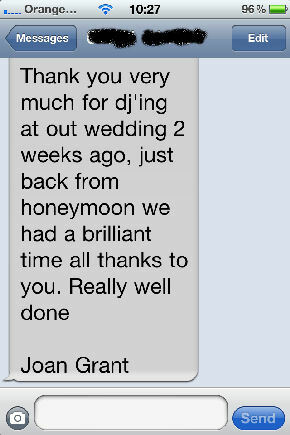 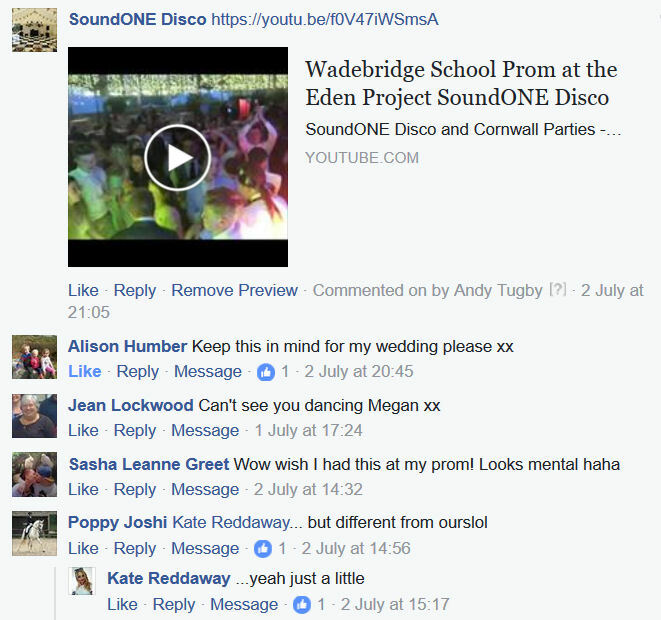 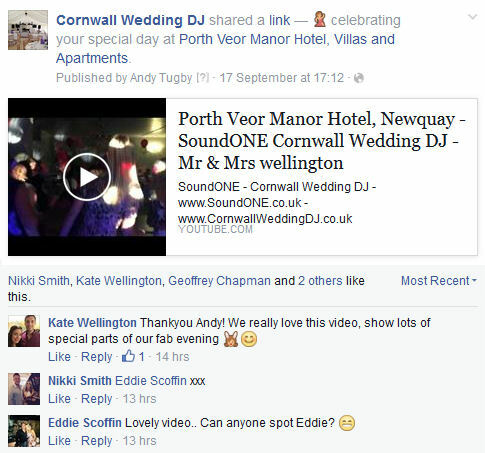 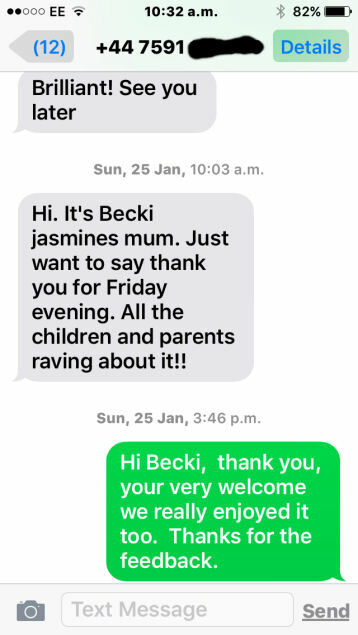 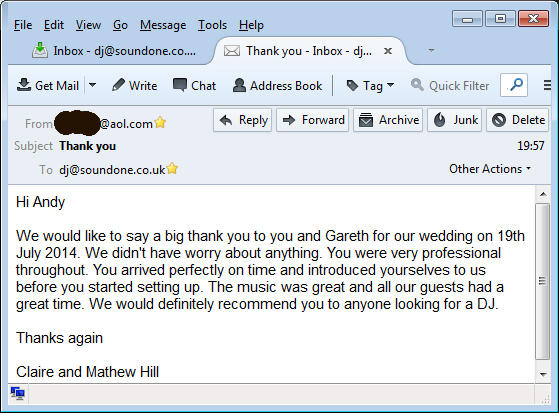 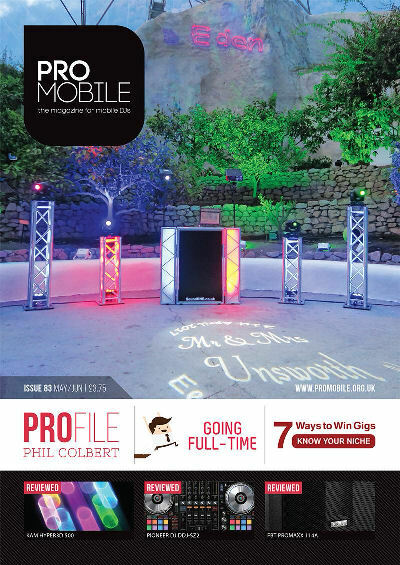 "Our DJ was AMAZING I would recommend you book ME them for your party!" 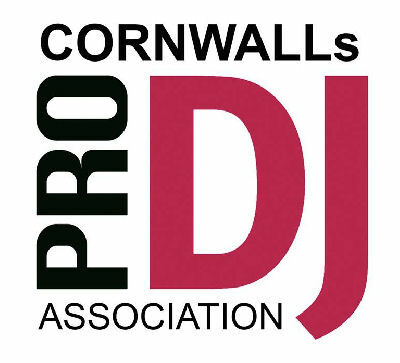 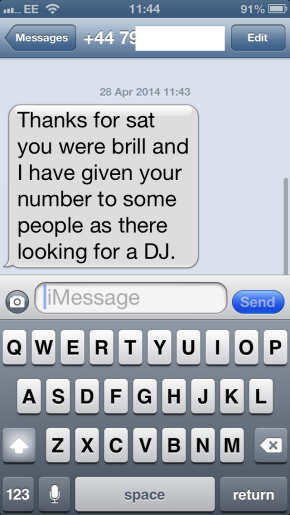 Please be aware of any so called DJs who do this as it could quite easily and is very likely to be completely made up. 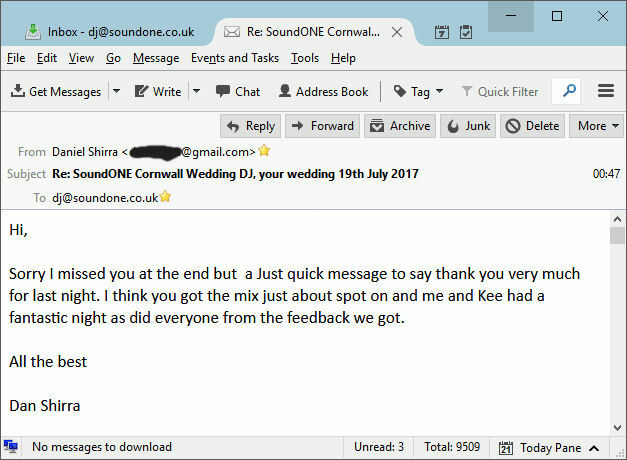 The below feedback really is just a few selected at random. 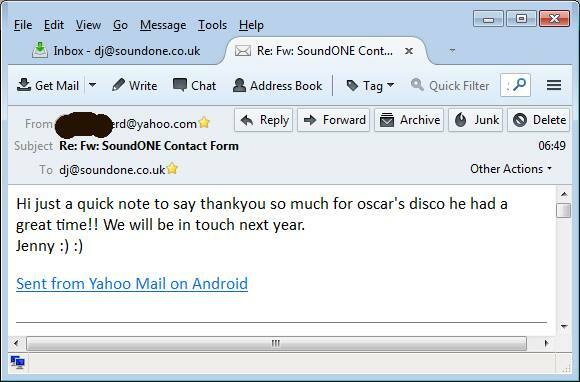 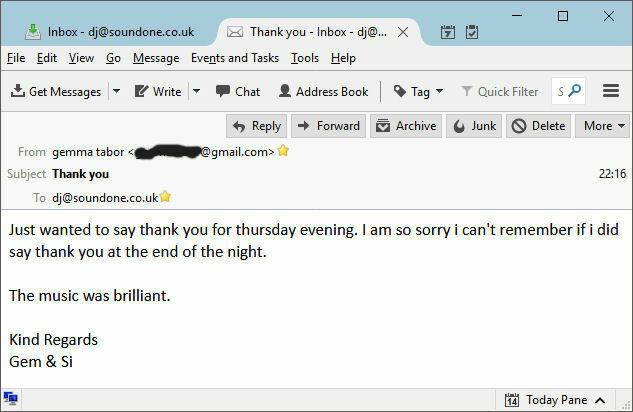 We have blacked out things such as telephone numbers and email addresses for obvious reasons and we will try to periodically update this feedback page, as and when we get the time. 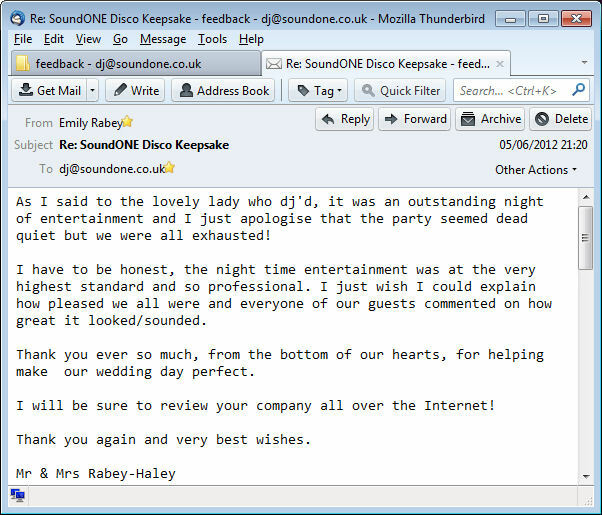 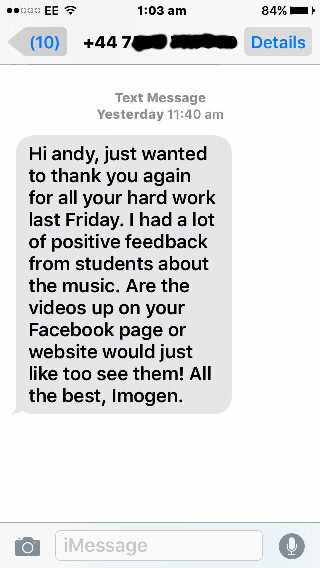 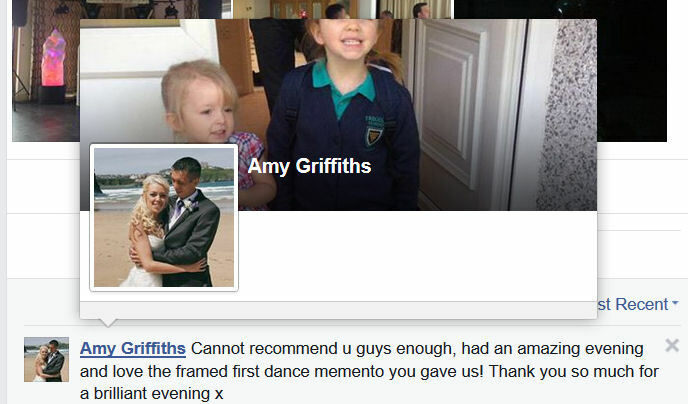 So please keep sending us your feedback, it is much appreciated, thank you.